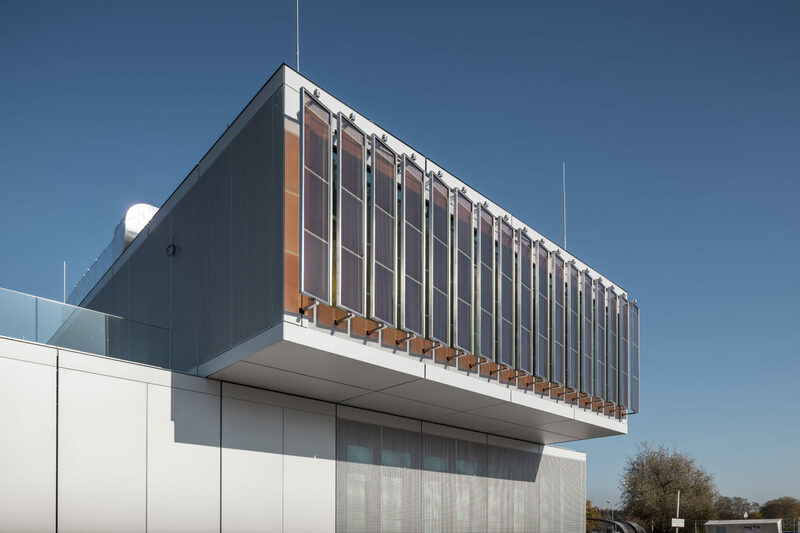 Henn Architekten designed the Merck Innovation Center in Darmstadt using individual steel modules. 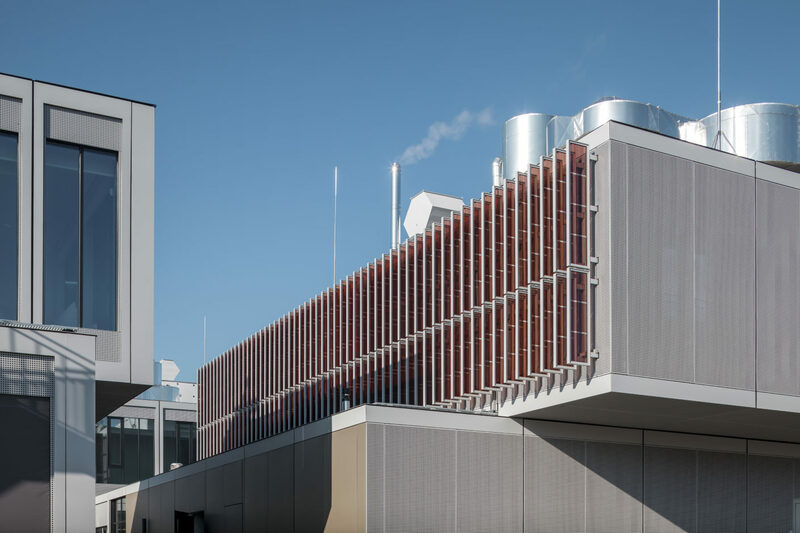 For the company’s 350th anniversary, pharmaceutical and chemicals corporation Merck is transforming its home base in Darmstadt into a state-of-the-art global headquarters. As part of the ONE Global Headquarters strategic initiative, construction work kicked off with a so-called modular Innovation Center. 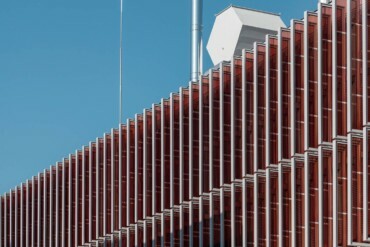 And the new building, designed by Henn Architekten, also boasts a technological innovation: a colored solar shading louver system by Colt International that generates electricity. 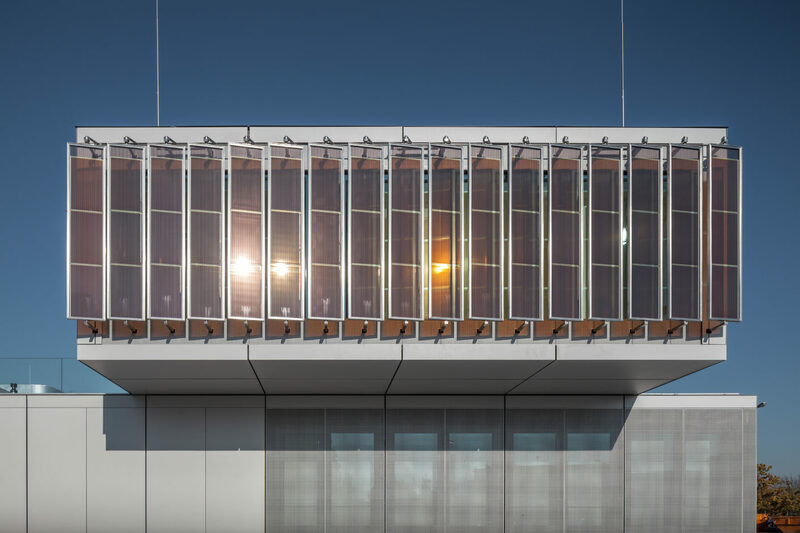 The vertically installed, moveable solar photovoltaic elements also provide shade and heat reflection. Merck developed the dye-sensitized solar cells, which Colt integrated into the Shadovoltaic facade system. 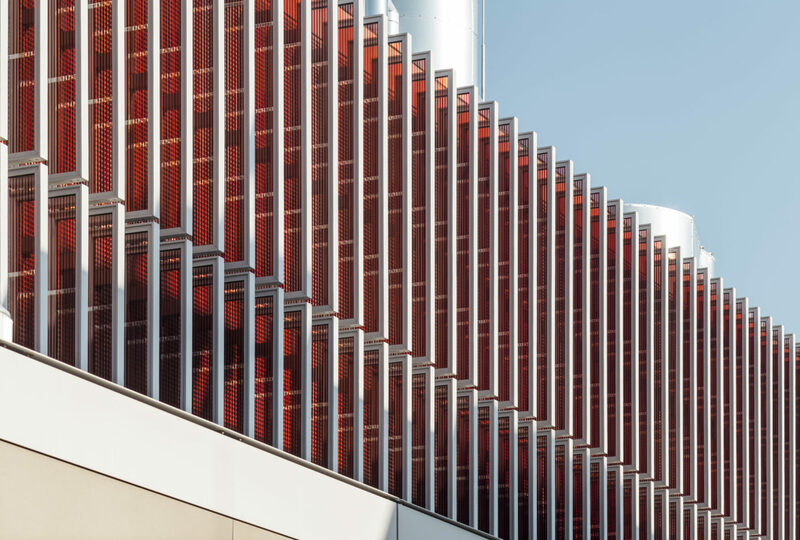 In this way, the striking orange louvers provide an indication on the building’s exterior of what is to be developed inside. 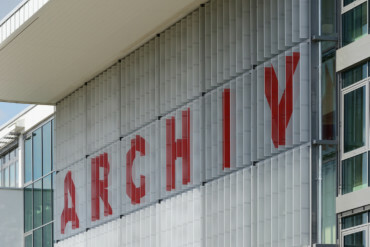 The modular innovation center is the first strand in the new headquarters. Taking their cue from the model of co-working spaces, here employees can progress into the role of start-up entrepreneurs and advance products with company support. 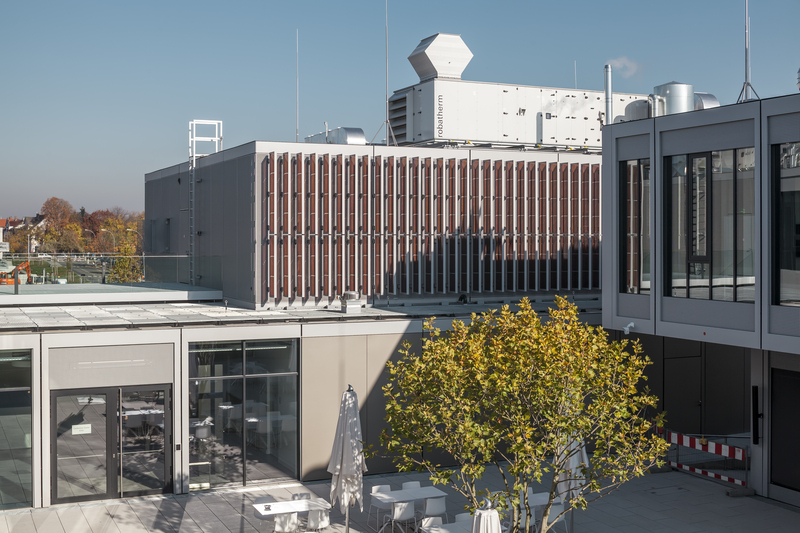 Across 4,000 m² of floor space, the two-storey building, whose modular elements are arranged around an interior courtyard, accommodates flexible working spaces for alternating interdisciplinary teams, together with a cafeteria and conference areas. Facing the central square and inner courtyard, Henn Architekten selected prefabricated steel elements with floor-to-ceiling windows. The elements rise up above a base plate, appearing lighter and look as though the one was shunted across the other at right angles. Overall, the building has a temporary look about it – and this impression is intentional, as in 2018 it is to be replaced by a considerably larger innovation center and will thereafter function as the campus visitor center. 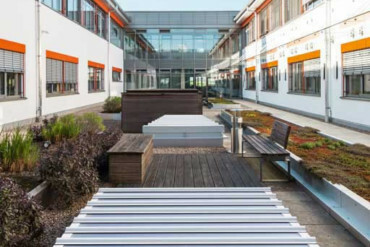 In the new function, the colored solar PV lamella will continue to be a real eye-catcher. They contain dye-sensitized solar cells, which generate enough electricity for a single-person household. In addition, the photovoltaic elements by Colt track the course of the sun. 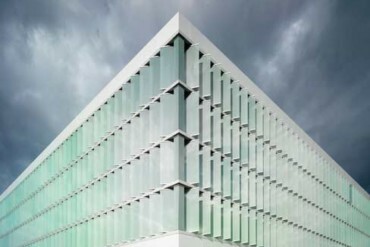 And the windows in the building can be darkened using liquid crystals, another Merck innovation. 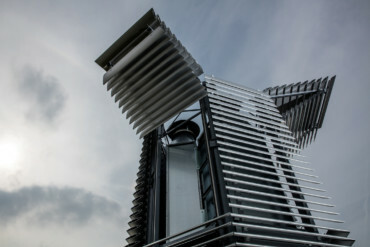 On the south side, fixed louvers also generate electricity using bifacial solar cells. In other words, the facade elements by Colt combine high architectural standards, efficient solar shading and electricity generation. 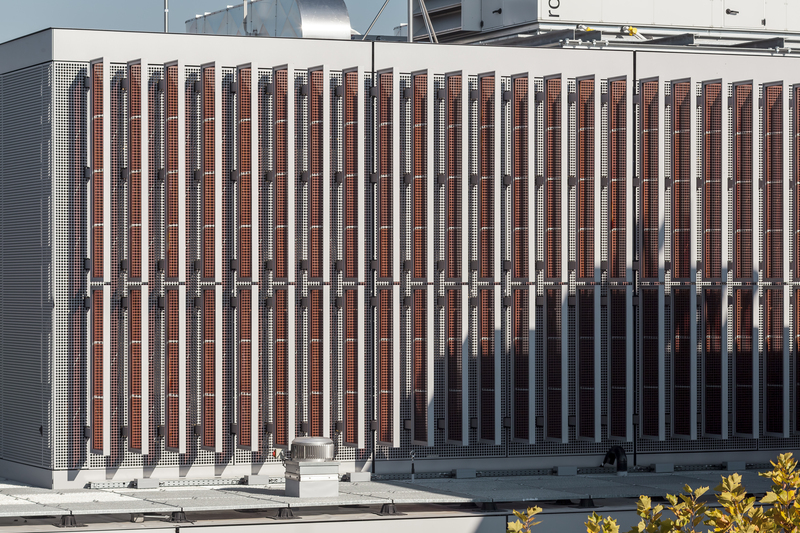 The modules seem to be stacked on top of one another, reinforcing the idea of the building’s temporary use. The colored photovoltaic louver system by Colt sets the tone of the building as a whole. 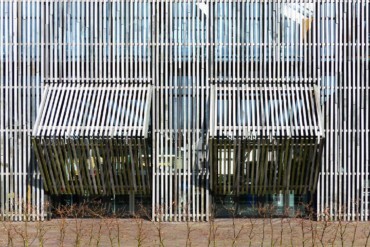 The dye-sensitized louvers also provide solar shading for offices and other workspaces. 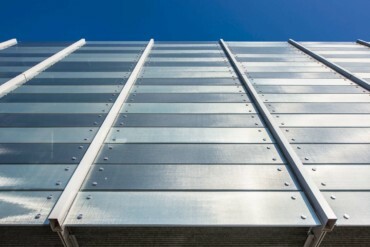 The Colt louvers are integrated into the bevelled stainless steel frame and track the path of the sun.